Mesut Özil is a world-class player. He has the wonderful ability to pick the perfect pass. He boasts incredible vision and sees passes that only he can see. He has won the World Cup with Germany and he has an impressive tally of goals and assists in both the Premier League and La Liga, where he formed a strong partnership with none other than Cristiano Ronaldo. An integral member of Arsene Wenger's squad, the playmaker has been pushed to the periphery of Unai Emery's squad, with the new manager asking for more intensity, energy, a willingness to track back and also press and, most importantly, consistency. Özil has missed a number of games but has been utilized more and more in the past few games. He has impressed in his recent performances, scoring and assisting in the 5-1 battering of Bournemouth. Many Arsenal fans were quick to judge Unai Emery after Özil was exiled to the bench and sometimes not even named in the matchday squad. Criticism of Emery was loudest when Arsenal's attack looked flat and lacked creativity. It is clear that Özil is still a world-class player, as his performances in the past 4 games have shown. Arsenal's incredible attack has been more fluid when he is included in the starting XI. There is a feature which the German international provides that is just as important as his goals and assists: speed. 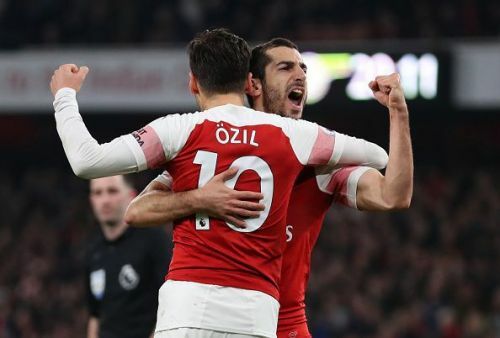 In the games that Arsenal's attack has looked flat, the movement of the ball is slow and ponderous, with many passes going sideways or backward. Sideways and backward passes are not always ineffective. They can be used to invite a press and shift the opponent around. However, the passes must move quickly to displace the opposition. No player should be taking longer on the ball, using more than 5 touches to pass. That's where the mastery of Özil comes into play. Özil plays at a quicker pace. He assesses his options and if none in front of him present themselves, he passes back quickly or shifts the point of attack. His speed, even in playing backward or sideways, is important and livens up Arsenal's overall play. The German playmaker, if used by Emery, can create a free-flowing attack that can wreak havoc on any defense.